The New Moon in Pisces inspires me to turn to the poems of Rumi. I know no other poet who captures the mystic cravings of Pisces better than Rumi. Looking through The Essential Rumi this morning, I noticed some advice. In fact, Rumi is full of advice, flooding over with advice, he expounds constantly on how we should live our lives. If he didn’t so wonderfully exhort me to follow Beauty at all times, I might not be so inclined to listen to such a poet. But he does. And every time, I fall in love. Here is the lunatic advice I heard this morning. Take care of the Donkey. Good advice. It occurs to me that this lunar month, we might do well to follow this advice. First, Fall into the Ocean. The Ocean is the New Moon in Pisces that occurs on March 7, 2008. Uranus is conjunct this Sun and Moon. Jupiter sextiles the trio. How expansive! During the season of Pisces, the weather doesn’t know whether to freeze or thaw. We are trying to wake from out winter’s sleep, but aren’t quite there yet. We are groggy. We think we might have to try harder, but then perhaps what we really need to do is just fall into the ocean of being and dreaming—where dreaming is awakening and awakening is dreaming. Uranus itches for a change, but not a change we have experienced before, not the same old change. What if we simply fell back into the ocean? What beauty arises? Later in the month, the Uranus in Pisces desire for oceanic change will deepen when Mercury, Venus and Jupiter come together with Uranus in a dance of connection, beauty, and possibility. 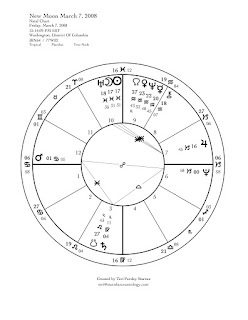 March 27 - Mercury (19 Pisces) is sextile to Jupiter (19 Capricorn) and Mercury also is conjunct Uranus (19 Pisces). March 28 - Venus (19 Pisces) is sextile to Jupiter (19 Capricorn) and Venus is conjunct Uranus (19 Pisces). Jupiter and Uranus are sextile to each other. Become the Lover. Mars is the Lover. And he has been on a journey. Read my description of the Mars retrograde journey here and here. For Rumi, the Lover is the mystic, the poet so in love with God, that he will do anything to reunite with the divine. Rumi advises us to be so in love with our dreams that we will never stop pursuing them, though this in not always so easy to do. During the Mars retrograde journey we may have lost our way, the beloved may have been hidden from us, or we may have lost faith in that dream. Rumi would say, this is all a way for the Beloved to become even more lovely to us. The bulk of Mars’ retrograde journey has been in the water sign, Cancer. During the last few months, have you encountered sea monsters which have kept you from your beloved? Has the ocean of feeling threatened to overwhelm? Now is the time for resolution and healing. The Lover is returning through the final degrees of his Cancer journey this lunar month. And he is meeting a strong challenger, Pluto. In fact, the story of the Lover merges with the other piece of advice that Rumi has for us: Break the Wine Glass. Pluto’s mission is transformation – the destruction of old form – so that life renews. The Wine Glass holds our ecstatic connection to Mystery and it also holds all the illusions that we hold onto that substitute for Mystery. What old forms need to die? Do we dare to break the glass in order to be refilled with the true wine? Pluto challenges us to transform anything that we hold onto because of our fears. Pluto is big right now. The planet entered Capricorn in January and at this New Moon, Mars, the Lover, opposes the glass breaker, Pluto. Perhaps the heart breaks. Perhaps the glass becomes bigger, able to hold more. The day after the Spring Equinox on March 20, Sun (1 Aries) is square to Pluto (1 Capricorn). 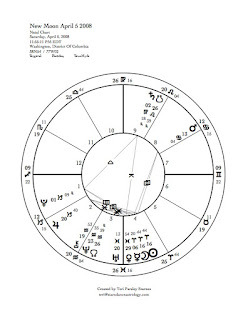 In the chart for the equinox, a chart that will influence the entire spring season, Mars, Pluto and the Sun form a T-square aspect configuration. The spring begins with a breaking of glasses and a promise of rebirth. Full Moon of March 21 - There is a Grand Cardinal Cross at the Full Moon. 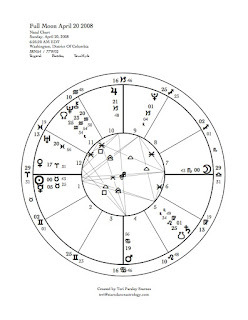 The Sun (1 Aries) opposes the Moon (1 Libra), which is squared to Mars (6 Cancer) opposing Pluto (1 Capricorn). A Cardinal Cross is like a crossroads for the cardinal signs – Aries, Libra, Cancer, and Capricorn – all initiators, all problem solvers. The problems are many. Now is a time for choosing. Ripe with life lesson, perhaps Mars is the guide to follow. Where does Mars in Cancer, the compassionate warrior, tell you to go? March 30 - The Sun (9 Aries) is square to Mars (9 Cancer), illuminating the hero/lover’s journey that is almost complete. April 2 - Pluto stations retrograde. This is a potent time for Pluto energy. Feel the transformative energy coming through the springtime earth. April 4 - Mars returns to the stationary degree (12 Cancer) where it turned retrograde in November. The journey is over. Grieve the lost Friend. The Friend is the guide or spiritual teacher who initiates us and then abandons us. The feeling of abandonment and grief belong to the planet Neptune, the ruler of Pisces. Much of Rumi’s poetry is the language of exquisite longing. His poems teach that grief for abandoned dreams, loves lost, failed endeavors is the way we get back to those dreams, loves, and goals. At this New Moon, Neptune stands with Venus, Mercury and Chiron. Is there a lost friend to grieve in your life? Venus as muse, Mercury as communicator and Chiron as shaman may be your guides to expressing and understanding that grief this month. Take care of the Donkey. You’ve got to love a mystic who tells us to take care of our donkeys —the animal bodies which carry our divine spirits. Too much watery Pisces and we forget that we even have bodies. The opposite sign, Virgo, reminds us that we do. Saturn in Virgo balances Pisces this month. Rumi would say that if we neglect our bodies, we do not deserve the ecstasy of our spiritual trances. If we can not tend the physical gift of our animal natures, we will not be able to sustain the oceanic feeling of transcendence. To honor Saturn, I invoke the patience needed to tend my physical needs. I honor Pisces this month. I honor the transition from winter to spring.